Check it out. 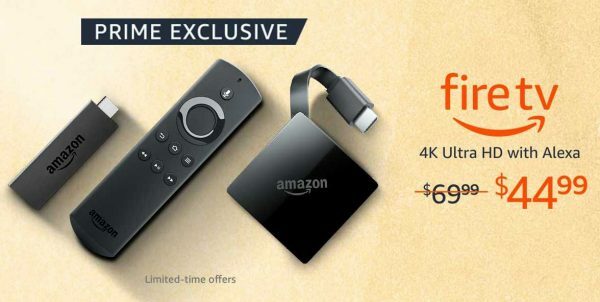 Amazon is currently offering a Prime Exclusive deal where subscribers can get a Fire TV Stick for only $24.99 (List: $39.99) or a 4k Fire TV player for only $44.99 (List: $69.99). The discounts are for a limited time only and available exclusively for Prime Members. Jump over to Amazon to grab a Fire TV device while this discount lasts. We let you know whenever we find special deals on electronics, entertainment, and gadgets. Support this site by clicking on the provided partner links! See the latest deals!